Sometimes it’s nice to have a fast, easy way to gauge how the nutritional profile of what’s on your plate stacks up with what the experts are saying. Look no further. Harvard School of Public Health is here to help. For perspective, below are three other visual food charts, all created by the USDA. The USDA is charged with supporting both the agricultural sector and public nutritional health. While these responsibilities seem a natural fit, they also create some irreconcilable tensions. (For example, the USDA recently recommended that Americans enjoy Meatless Mondays. The National Cattlemen’s Association fired back and the USDA quickly recanted.) These tensions are reflected in the USDA’s graphic nutrition advice efforts. First up was the 1943 Basic 7. I especially love the admonition to “eat any foods you want” at the bottom. My, how times have changed. 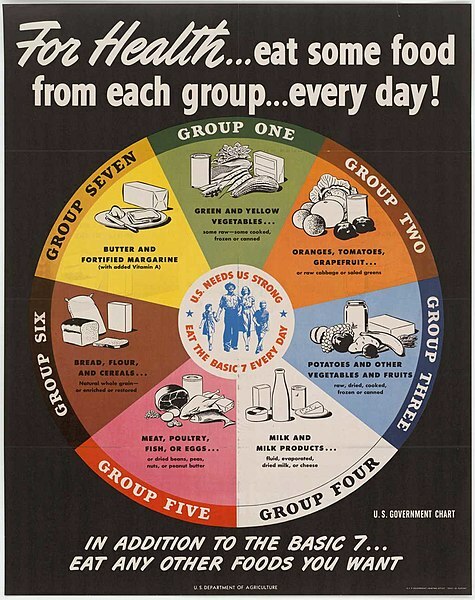 The USDA then went to a Basic 4, trying to keep if simple. Then, they changed it up again. Next up, the 1992 Food Pyramid. Most recently, there was the USDA Food Plate. Published in 2011, this is a vast improvement in simplifying the USDA’s information. Somebody hired a good graphic artist – that much is clear. Visually beautiful and very simple, it doesn’t tell the story of the intense lobbying that went into its creation. Notice the special dairy section? That was added specifically due to lobbying efforts by the dairy industry. But leave it to Harvard School of Public Health to create the best of the bunch. Being unencumbered by allegiance to food producers, they are free to concentrate exclusively on the health needs of the public. 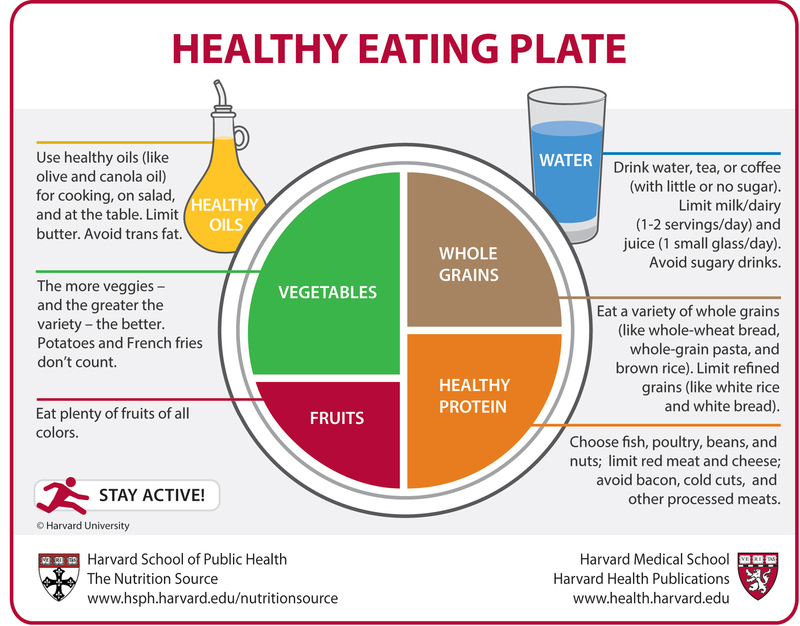 Though not as graphically beautiful as the USDA’s plate, for the best information on what to eat at your meals, just make your plate reflect the Harvard Healthy Eating Plate.